P90X Peak Health Formula is one of the most powerful multivitamins available on the market, specifically formulated to be the ultimate nutritional support for people doing the P90X Extreme Workout, Shaun T Insanity, or Rev Abs. This Beachbody multivitamin includes high-potency vitamins, minerals, antioxidants, herbs, and phytonutrients that will increase your strength and enhance your energy.Guaranteed! What makes P90X Peak Formula Unique? The P90X Peak Health Formula will support and protect your body so you can be healthy and endure the intensity of the P90X workouts, it will help you build lean muscle, replenish and improve your energy and it will help getting faster results and maintaining them. The P90X Peak Health Formula’s potent and balanced formulation guarantees important savings compared to the alternative of purchasing each ingredient separately. The Bottom Line: Effective utrition at an unparalleled value! 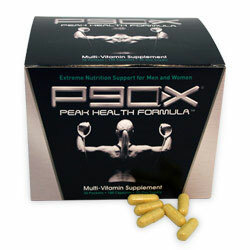 P90X Peak Health Formula has the highest quality of ingredients - high-potency vitamins and minerals and powerful antioxidants like alpha-lipoic acid, grape seed extract, and Co-enzyme Q10 - at its purest and most effective form. Its formulation is not only potent and balanced but safe to ensure the proper and efficient supply of nutrients to the body. Plus, when you purchase through the GetMoving Catalog, you are covered by our 30 day, no questions asked guarantee. So go ahead and shop with confidence. The P90X Peak Health Formula works wonders on your body inside and out. Inside: supporting and strengthening your immune system, improving and maintaining your energy levels, cardiovascular health, memory, and neural function. It also improves joint flexibility, reduces mental aging and reduces stress levels and protects body cells from free radicals damage. Outside: Helps delay the aging process and improves skin, hair and nails. Your body will look toned, rejuvenated and super healthy. Directions: Take one packet (6 capsules) daily with a meal.